The Washington Fire Department Junior Fire Academy is designed to give the youth of the area a real life look into the fire service. The events include CERT training, Live Fire training, Disaster training and much more. Our goal is to provide a safe fun learning experience for local youth and inspire future public servants. 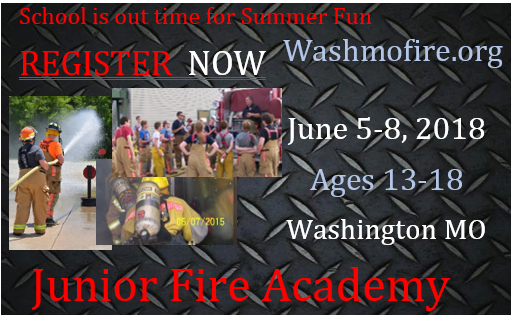 The Washington Fire Department Junior Fire Academy will begin promptly at 8 am and conclude at 3:30pm. On Friday June 10 at 7pm a graduation will be held. Parents and family are encouraged to attend. The Washington Fire Department Junior Fire Academy will be held at the Washington Fire Training Complex at 6531 Maurice Unnerstall Drive, Washington Mo 63090. If you need to contact your Cadet please call 636-390-1020. Lt. Nick Risch may also be contacted on his cell 314-581-4566 if no one is available at the admin office. 1. No one may leave camp without permission. If you leave, written permission is required. 2. No alcohol, fireworks, weapons, tobacco, or drugs are permitted in camp. Check medications with health personnel. Violators will be sent home without refund. 3. All Cadets will be at their assigned location at all times. 4. Cadets who bring a car to camp must leave it parked during camp. 5. Cadets are not permitted in others’ belongings. 6. Cadets will be charged for the cost of any physical facility and/or resource damage for which they are responsible. 7. Cadets are not permitted to have cell phones in camp. A phone is available for emergency calls. 8. Cadets shall follow all health and safety guidelines set by the Instructors. Cadets will be participating in classroom and physical training. Please dress in Cotton clothes, including pants and shorts, need to be appropriate for all types of activities. Cadets will be provided with lunch each day. If any allergies exist please let the Instructors know on the first day of class. Refreshments will also be provided.